Picked up some euros at whitehall location right on Trafalgar square. Really good service and really good rate - would recommend! Super efficient service, id use again 100%. Thankyou for advising me and understanding your business you saved me time and money. Absolute top notch service , Ive used them a couple of times and recommended them to everyone I know, Friendly staff great rates. would NOT GO ANYWHERE ELSE. I was more than pleased with Whitehall FX. I placed my order on the Monday morning and received it on Tuesday by Midday, I was advised to make a bank transfer as it was cost free as opposed to a card a payment which comes with a charge and although I was concerned at first due to having not used this company, Michael who took my call was very reassuring so I went for it. Id use again no reason not to. I had the same issue as Rob being charged a further in online processing fee which is an absolute disgrace. I have never come across this with any other online currency provider before. I should have read the reviews first. Like Rob I would avoid this company, I certainly will not be using them again. I am sorry you are disappointed with our service, With regards to the 2% fee for cards, we are forced to pass this charge on from our card provider due to our very competitive prices and our free postage service, we would not be able to operate as a business otherwise. It is unfortunate but we do state this clearly and you can use our other method of payment by bank transfer which is FREE and quick, We always advise our customers to use the transfer method as we do not wish to charge anything for making a payment. If you wish we can refund your money and you can make a transfer. Rob these charges are passed on from our card provider which are clearly stated in our ts&cs. We are not happy charging anything for debit/credit use however couple this with free postage and as we work on the best available rates our business would become unworkable. We encourage bank transfers as they are free and quick. We would be happy to refund you if youd prefer to make a bank transfer for your order which costs nothing. Ordered currency at 3pm arrived next day Royal Mail delivery at 9am. Best rate, on the day. Will use them again. Super service, arrived the following morning as promised. Friendly staff, will use again. this was a very quick and efficient service, I ordered my Euros yesterday morning and received them along with my normal mail at 9.10am this morning. Best rate but had to chase it a bit. After several phone calls the order arrived. Currency (Turkish lira) seemed to be difficult to obtain. Main issue - not responding to emails. I was very impressed with this company and the first rate service it provided from start to finish. It was made easy for me through the whole process via a phone call and an email and I received my currency the very next day. 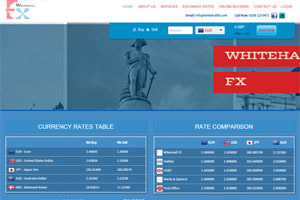 I will certainly use Whitehall Fx again and I would recommend them to friends. We are delighted that you took the time to review us and that you found our service to be exactly how we try to make it, quck, simple and hassle free.